Heirlooms are not your average tomato, and require more attention to detail for optimal fruit production. These fruit have been bred to produce the Sweetest, Tastiest Fruit, and are the Crown Jewel in the experienced gardener’s summer crop. These delicious treats don’t produce armloads of flavorless red balls, commonly found at most grocery stores. Heirloom Tomato plants concentrate much more of the plant’s energy into each fruit, which gives them better flavor quality in lieu of quantity of fruit. This means the more that can be done to encourage maximum fruit production, the better, for Heirloom-type tomatoes. For Solstice Farm, this means several things: better soil preparation, attention to pruning, and a sturdy wire trellis system. Let’s go over everything from the start. Start tomatoes early, around 6-8 weeks before the average last frost date. Tomatoes are easy to up-pot if they get leggy in their starter pots, but heirlooms started late may not get close to their yield potential, as they have longer ripening types than more commercial hybrid varieties. They are best started with some kind of climate control, either indoors under lights, or in a greenhouse. Modify for your climate. Use a germination type soil mix for seeds, and never add fertilizer until after things have sprouted to reduce disease. Fertilize starts every week or two with a blend of fish emulsion and seaweed to get them nice and strong before setting out. After 6-8 weeks, its time to plant them out! For field planting, creating a great soil is critical for heirloom tomatoes. They are some of the heaviest feeding plants in the garden, so don’t skimp if you want good results. Amend soil with 2-4 inches of compost minimum before planting, and add approximately 1 cup organic fertilizer (approx. 4-2-3), and ½ cup of humates or other trace mineral supplements PER PLANT. Adding ½ cup of bone meal or other high phosphate supplement will boost fruit production even more. Lightly top dress with more organic granular fertilizer every additional month flowers are setting fruit, or feed liquid organic fertilizer directly through irrigation lines every couple weeks during fruit set, normally late April through June in most climates. If you have low calcium soil, adding a calcium supplement is critical to prevent blossom end rot – a condition that causes black rot spots on maturing fruit where the flower used to be. Use raised rows that are at least 12” tall, but ideal soil has been amended to the point beds are 20” tall by 30” wide. Tall and wide planter boxes or pots will work, too. Good drainage is essential with tomatoes, as they do not like constantly wet roots, which causes disease. Once soil has been amended, set out starts at 30” spacing (two and a half feet). If starts have become leggy (stretched out), no problem! Tomatoes can be buried as long as there are 4-6” of top growth exposed. Roots will begin to form off the side of leggy vines that have been covered with soil after a week or two. Once everything is planted, its time to start maintenance. Trellising is very important with indeterminate tomatoes like heirlooms. Indeterminate means that fruit ripens successively, so providing a support for growing vines is necessary. Most folks are familiar with the tomato cage, and that will work in a pinch, but professional set ups go several steps further. 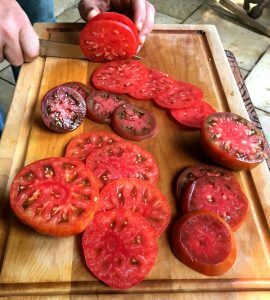 Since heirlooms really concentrate flavor, and are larger in size, but set less fruit, the more that can be done to encourage fruit production over vegetative growth, the better. Regular pruning in the first 2 months is critical, and a wire and string trellis system is needed to support the weight of heavy single vines. To prune, only allow 2 – 4 leader vines on a single tomato plant. This means snip or pinch off any side shoots other than the strongest vines. Tomatoes only set flowers on a new vine after 3 or 4 leaf nodes (where leaves come off main vine). After the first 3 or 4 nodes, flowers will set on the vine every other node. So, by cutting off side shoot vines, you reduce the amount of energy the root system puts into vegetative growth on new vines, and maximize flower set, and hence fruit on select stronger vines. Vines pruned in this way can weigh upward of 20lbs when loaded with fruit, so only a strong trellis system can support them. An easy, and sturdy trellis system can be built with 8ft or 10ft steel fence stakes from a building or farm supply store, at 10ft spacing, and then running a taut top wire from the stakes. It helps to angle the end posts away from each other to keep them from bending under the heavy weight that will be suspended from the top wire. The top wire MUST be metal wire, and not twine, which will break. Off the top wire, drop a sturdy 20lb test weight line for each individual vine, so a 10ft section of trellis will have 4 plants, and 8-16 lines tied from the top wire and ending at soil level. As the tomato vines grow and are pruned into a long single vine, twirl them around the drop line. Very loosely tie the line off at the base of the vine. If its too tight, it can sever the vine later on when it grows fatter and cut into it. If the plants get tall enough to reach the top wire, don’t worry, you can let them hang/grow back down once they reach the top. After the first 2 months, stop pruning and allow the plants to get bushy again. This can help develop a shade canopy to prevent sun scald on fruit, and makes them less obvious to birds, bugs, and rodents. Watering is very important for the best tomatoes, but most people don’t realize not to OVER water them. Tomatoes do not like overhead sprinklers, and prefer drip irrigation or flooding. 2-3 times a week is more than enough. 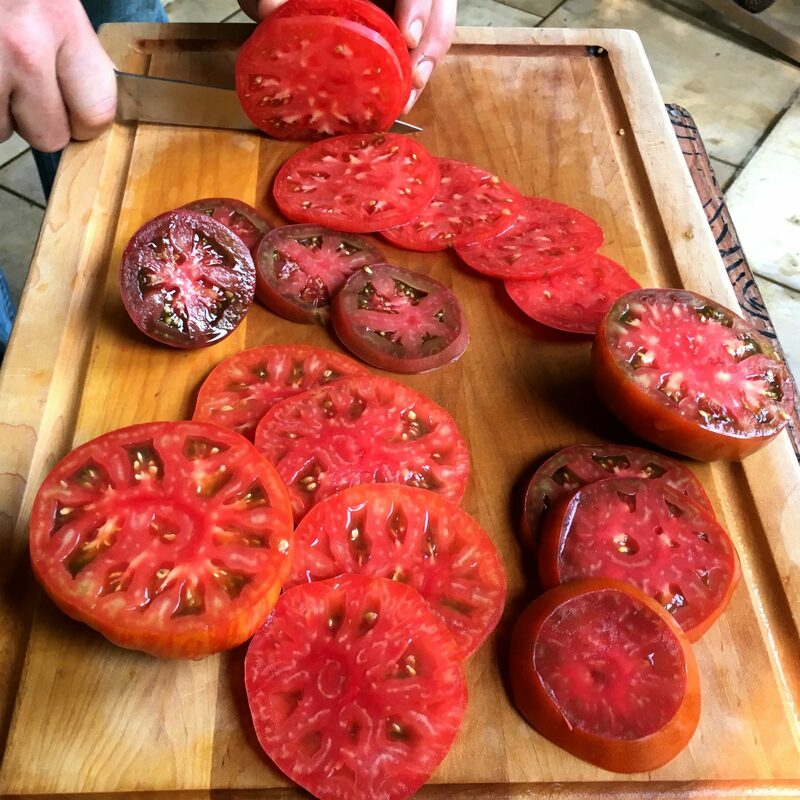 Allowing soil to dry out somewhat between irrigation allows sugars and flavor in the fruit to develop and helps prevent splitting – a very common problem in big, thin skinned fruit like heirloom tomatoes. Speaking of problems, bugs and disease also like tomatoes. Most disease is caused by overwatering or poor weather, but bugs need some additional care. Mostly when young, aphids can be a problem. Azatrol, which is a Neem oil extract, is very effective for all manner of insects on contact, and is a non-toxic organic certified product. For worms, Neem and Azatrol are OK, but BT (bacillus thuringeinsis) bacterial culture is the most effective treatment. You don’t have to spray the actual worm, just the plant, and the bacteria will be eaten and then kill the worm. BT is Organic Certified, but does have some minor negative health effects, so I don’t recommend using it unless absolutely necessary. Stink bugs are another major pest, and organic options are more limited, unfortunately. Azatrol and neem works, but since they migrate around, they are difficult to find actively feeding on fruit and use contact effective spray. They can be kept away from plants by growing in hoop houses, or shade cloth houses in hotter climates, which physically excludes them. Another effective trick is to make sure there are plenty of sunflowers in bloom, which attracts them away from garden plants to a preferred food source. To harvest, pick when ripe. They can be picked early at the ‘blush’ stage, and will continue to ripen off the vine, but never pick green or mostly green. Heirlooms just never develop full flavor if you pick them too early, and really need to vine ripen to some degree. Never stack them when harvesting if possible, as they bruise easily. These tomatoes are best enjoyed fresh in any way imaginable. They can be canned, but are much sweeter than saucing tomatoes, and have much more liquid, which takes far longer to cook down, so be warned. When cooked down, and strained to a thick paste, they probably make the best pizza sauce there is! No sugar needed.